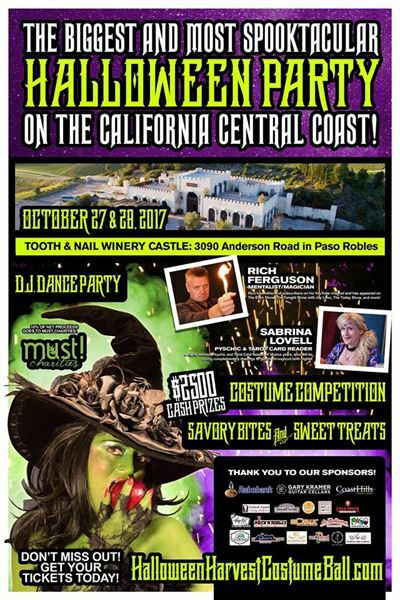 This year is the inaugural Halloween Harvest Costume Ball taking place on October 27 and 28, 2017 at the iconic Tooth & Nail Winery castle in Paso Robles. The evening is being described as “Wine Country Goes Hollywood”, combining fine wines, themed bites from local restaurants and an immersive evening designed to awaken and tantalize all five senses. The event is a 21-and-older affair requiring attendees arrive in full costume regalia. 10% of Net proceeds will benefit must! Charities, a San Luis Obispo county nonprofit. The event will include interactive props, creeping fog, dramatic lighting, spooky sound effects and professionally trained actors including world renowned mentalist and magician Rich Ferguson, featured on The Ellen Show, Late Night with Jay Leno and who has millions of YouTube subscribers. Rich will be roaming the castle and astonishing guests all night with his trickery and illusions. There will be a DJ Dance Party happening all nights and be sure to get your costumes ready… Our contest gives out $2500 CASH PRIZES! Event producer, Brad Golden says, “There is nothing in San Luis Obispo county that is upscale and geared specifically for adults for the Halloween season. We are creating a high-end production that will provide a rich and immersive experience for our guests.” Read more about the event HERE! A portion of the proceeds will benefit must! Charities in Templeton, California.